When you have a missing tooth—whether because of severe decay, injury or gum disease—the worst part is probably the way your smile looks. That’s often the chief reason people see their dentist for tooth replacement. Of course, you still need to decide which type of tooth replacement suits you best. Dentists often recommend dental implants. Why? Because no other tooth replacement substitutes for a tooth from root to crown. Yes, a bridge or dentures can make your smile whole again. However, they cannot offer the stability and jaw support that you get from dental implants. When you choose dental implants, you get more than just a rebuilt smile—although that is certainly important. 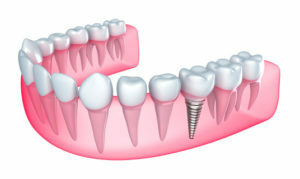 Dental implants provide the security that other tooth replacements simply cannot offer. Because an implant is surgically embedded in the jawbone beneath the open socket of a missing tooth, you can rest assured that your new tooth is not going anywhere. Just like a root, an implant holds the tooth restoration firmly in place. You never have to worry about a denture that slips. And with that implanted post, your jawbone receives the stimulation it needs to stay healthy and strong. A root doesn’t only hold the tooth in place, but it also keeps bone tissue regenerating so your jaw maintains its natural shape and youthful appearance. Without a tooth root, bone is lost and the consequence is often a sagging facial appearance that ages a person prematurely. A dental implant, however, acts just like a natural tooth root so your jaw stays strong. What’s the Process of Receiving a Dental Implant? Once you and your dentist decide that a dental implant is the tooth replacement for you, then the process is well planned from the start. A small incision is made in your gum tissue in order to access the bone and place the implant. Then as you heal over the next 3-6 months, the implant and surrounding bone tissue form a solid bond. Once you are completely healed, an abutment is attached to the implant and this is what holds the tooth replacement. Whether you need a porcelain crown on a single implant, a bridge for several teeth or a denture to replace an entire arch, dental implants can give you the security and the smile you deserve. At Mingel Dental, our dentists and their staff are committed to providing patients with all the dentistry needed to have a smile that is healthy and attractive. We have an on staff periodontist who is trained and experienced in the placement of dental implants.